In your search for a new crossover SUV that can give you all the passenger and cargo space you need and the capability you desire, you’ll find that there are many to choose from that promise to give you just what you want. However, not every crossover is built the same and some just can’t offer exactly what you’re looking for. Two of the top vehicles in the popular compact crossover SUV segment of the auto industry that can give you what you need at a price that also fits your budget include the Mazda CX-5 and Ford Escape. Which one is the best option for you and will fit your specific needs the best? This detailed comparison of the 2018 Mazda CX-5 vs 2018 Ford Escape will help you decide by showing you some of their main differences. While the new 2018 Mazda CX-5 and 2018 Ford Escape have a lot of similarities, they also have many differences when it comes to each of their offerings, including their list of available technology features, comfort options and fuel economy ratings. 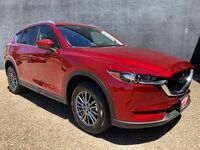 The 2018 Mazda CX-5 uses a 2.5-liter four-cylinder engine that offers a fuel economy rating of up to 25 mpg in the city and 31 mpg on the highway when choosing the Sport trim level with front-wheel-drive. The 2018 Ford Escape also uses a 2.5-liter four-cylinder engine but, it can only deliver an EPA-estimated fuel economy rating of 21 mpg in the city and 29 mpg on the highway when opting for the standard engine. Other differences that are noteworthy in this 2018 Mazda CX-5 vs 2018 Ford Escape comparison can be found in their list of standard features. The new Mazda CX-5 offers optional features like Mazda’s Radar Cruise Control and a standard leather-wrapped steering wheel whereas the Ford Escape does not even make them available.